Blog - Pixel Edge Design Studio: What Is 3D Visualization? Visualization is the ancient art of creating graphic renditions of concrete things or abstract ideas. Early examples of visualization might include cave paintings, and modern examples exist under a number of categorizations and might include the designs of buildings or vehicles. As computer graphics technology has become more accessible, 3D visualization specifically has become an important tool for engineers, scientists and a wide range of other professionals. 3D visualization uses computer programs to create three-dimensional representations of natural or manmade objects that can be manipulated, altered and efficiently communicated to others. For a long time, visualization has been employed using various media. In the modern world, visualization utilizes the latest technology to create complex three-dimensional representations or messages. 3D visualization removes the need to actually create a physical object while still allowing the design to be tested for certain variables in a virtual environment. The ability to design or recreate something on a computer using its technical data allows for a number of commercial possibilities and practical applications. For instance, an industrial designer might design a line of lamps using 3D visualization and can test whether the lamps could be made efficiently based on the design requirements and available resources. On the other hand, car safety researchers can collect data from a test crash and create a model of the crash based on that data, then use the model to make decisions about future improvements. A hotel might want to create a virtual tour of its rooms so that potential customers could see the hotel's best features before they even arrive. Besides commercial applications, 3D visualization is an important tool for scientists. For instance, a researcher might want to create a model of a natural phenomenon, such as tectonic plates crashing together, that can be imagined based on technical data but not actually observed with the human eye. Similarly, a climate scientist might create a 3D visualization of Earth as a model showing rising sea levels and how that could affect land masses. Similar to scientific application, 3D visualization also can be used for architectural applications. Without the technology, many fantastic architectural feats wouldn't be possible. Today's visualization is the same art that humans have practiced throughout history. Now, though, technology is much better and there is a lot more to draw. 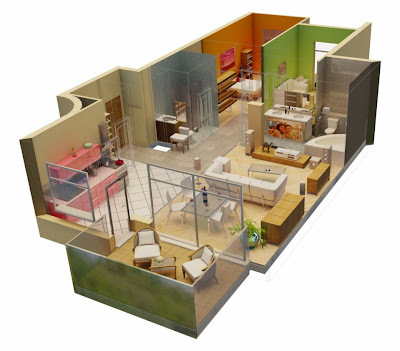 As technology increases, the capabilities of 3D visualization are likely to increase as well.